The original title for this recipe was Red Curry Red Kuri Soup, but that seemed utterly confusing. So, here we have a Red Curry Kuri Squash Soup, which is slightly less confusing. You probably know what red curry is, but do you know what red kuri is? Are you tired of these tongue twisters and riddles? Red kuri is a Japanese winter squash that’s also known as Hokkaido pumpkin. It has a vibrant red-orange color and is shaped like a teardrop. Once you slice it open, you’re greeted with a smooth, creamy yellow flesh. It has a subtle chestnut flavor and pairs exceptionally well with creamy ingredients like coconut milk. I’ve bought red kuri squash at farmers market and grocery stores like Whole Foods and Trader Joe’s, but if you can’t find it, you can easily substitute kabocha squash or butternut squash. Like most other winter squash varieties, red kuri works really well in Asian-inspired curries and soups. The balance of flavors is exquisite—savory and packed with umami thanks to the Shiitake mushrooms, a little sweet, and a little spicy. And once puréed with coconut milk, the result is a luxurious, silky smooth texture. Plus, red kuri sounds exactly the same as red curry. Did I mention that already? 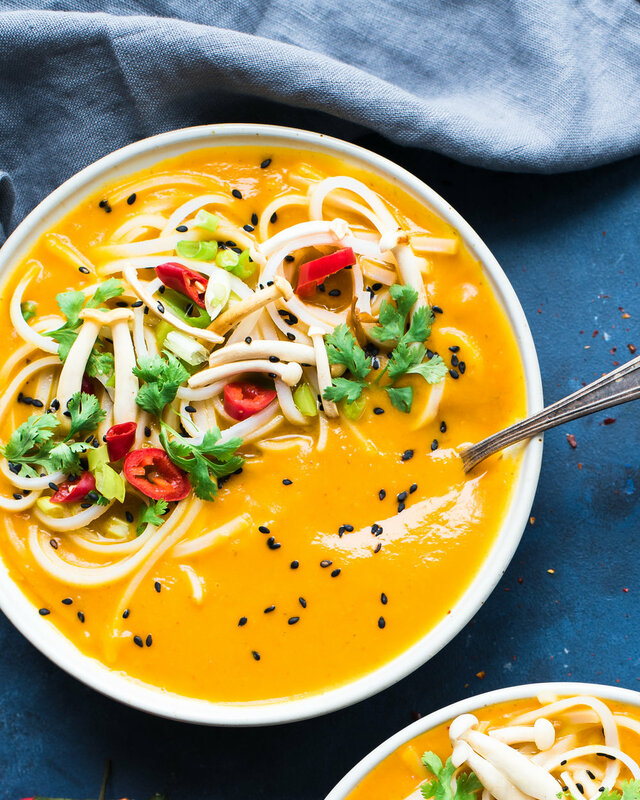 This red curry kuri squash soup comes together really easily in the Instant Pot, a multi-function pressure cooker. The reason I love using the Instant Pot is that it yields soups that have the depth of flavor that you’d get from a soup that’s been simmering for hours, but without all of that the slow simmering. And unlike many puréed squash soups, there’s no need to roast the squash beforehand. The squash will be infused with plenty of flavor from the red curry paste and aromatics. And if you don’t have an Instant Pot, you can still make this soup on the stove (instructions are below). If you make it on the stove, I do recommend roasting the squash in the oven, however, as you can’t just toss raw squash into the soup pot the same way you can with the Instant Pot. After cooking the soup, you can purée it directly in the Instant Pot using an immersion blender or transfer it in batches to a stand blender. It makes a lovely starter or side dish on its own, but to make it heartier and suitable for a main dish, I add some rice noodles. Rice noodles are really simple to cook—usually, the package instructions indicate to soak them in hot water for a few minutes. Not a fan of rice noodles? You can also add udon noodles for a heartier, chewier texture. Or, leave out the noodles entirely and serve alongside a big green salad and a crusty bread for a healthy yet indulgent-tasting meal. Finally, garnishes. I like my garnishes to add textural variety and a little pizzazz. Fresh cilantro is an obvious winner in any Asian-inspired curry, as are chopped scallions. Black or toasted white sesame seeds and roasted peanuts add a pleasant crunch, and crushed red pepper flakes add some surface heat if you like things spicy. Hope you enjoy this perfect-for-fall soup! Using a sharp knife, peel the skin off of the red kuri suqash and then roughly chop into cubes, discarding the inner seeds. Select the Sauté setting on the Instant Pot and after a few minutes, add the coconut oil, followed by the onion, garlic, ginger, and Thai chili peppers. Cook for 2 minutes, tossing frequently to prevent sticking. Carefully add the red curry paste and stand back, as the paste might sputter up. Cook for 30 seconds until the mixture is very fragrant. Add the shiitake mushrooms and cook for 3-4 minutes or until the mushrooms begin to release their liquid. Select the Cancel setting on the Instant Pot. Pour in the water or vegetable broth to deglaze the pan, using a wooden spoon to pick up any browned bits in the bottom of the pan. Add the coconut milk, coconut sugar or maple syrup, turmeric, salt, and tamari, and stir to combine. Secure the lid and set the Pressure Release to Sealing. Select the Soup setting at high pressure and set the cook time to 12 minutes. While the soup is pressure cooking, prepare rice noodles according to the package instructions. Once the Instant Pot timer goes off, carefully perform a quick pressure release by switching the Pressure Release to Venting. Open the pot and stir in the 3/4 cup chopped cilantro and lime juice. Taste the soup for seasonings and adjust accordingly. Using an immersion blender, purée the soup directly in the Instant Pot until smooth and creamy. Or, transfer the soup to a stand blender in batches, and replace the center cap from the blender lid with a dish towel to avoid trapping steam in the blender. Once the soup is puréed, pour it over the rice noodles. Or, ladle the soup into individual bowls and add rice noodles to each serving. Garnish as desired. Preheat the oven to 400°F and line a rimmed baking sheet with aluminum foil or parchment paper. Using a sharp knife, slice the red kuri squash in half lengthwise, and use a spoon to scrape out the seeds. Then slice each half again so you end up with quarters. Place the squash on the baking sheet and drizzle with olive oil and salt and pepper. Bake for 20 minutes, then flip and bake for 15-20 minutes until tender and lightly browned. Once the squash is cool enough to handle, peel the skin away and set the flesh aside. In a large saucepan or Dutch oven, heat the coconut oil over medium heat. Once hot, add the onion and cook for 5-6 minutes until softened. Then add the garlic, ginger, Thai chili peppers and fry for about a minute. Add the shiitake mushrooms and cook for 5-6 minutes or until the mushrooms begin to release their liquid. Add the red curry paste and cook until fragrant, about 2 minutes, stirring constantly. Add the cooked squash flesh and cook in the curry paste for 2-3 minutes. Stir in the water or vegetable broth, coconut milk, and turmeric. Increase the heat and bring the soup to a light simmer. Then lower the heat and cover the pot, and simmer for 30 minutes. Turn off the heat and add the coconut sugar or maple syrup, kosher salt, and tamari. Using an immersion blender, purée the soup directly in the pot until smooth and creamy. Or, transfer the soup to a stand blender in batches, and replace the center cap from the blender lid with a dish towel to avoid trapping steam in the blender. Stir the chopped cilantro and lime juice into the soup, stir, and taste for seasonings. Once the soup is puréed, pour it over the rice noodles. Or, ladle the soup into individual bowls and add rice noodles to each serving. Garnish as desired.